Re: Trans Am racing pace car pics...are there any? This photo was posted on this thread earlier but here is a clearer photo as scanned from my 1972 Watkins Glen program. the last race for it. Sorry - memory fade. In 71 the front drive-shaft yolk exploded going down the front straight - reason for the dnf that year. It was engine failure in 72. What happened when the driveshaft yoke went? Did it polevault the car or just fall out without doing much damage? Seems like many of the cars did not have driveshaft safety loops back then but maybe you guys did. .. instead of a loop, might have had just the same sort of angle iron lower stop that was on the Lagod camaro.. which was based on the tunnet being the 'upper stop'..
That sounds more like it as the tunnel was really beat up. Note that Jerry Lagod Q 19th and went out with engine trouble and I Q 20th and dnf with the driveshaft problem. Lady Luck was not smiling on row 10 that day. SMKZ28, back in post #80 you had a link to the facebook trans am site. there are a lot of cool shots there, thanks for that. there have not been any updates on that link for a while, I guess we are locked out ? I took the pictures with my digital camera while the footage was paused at 13:34 in the film. The 1968 Continental Divide Trans-Am had two identical '68 Mustang pace cars. Photo courtesy of Craig Fisher. 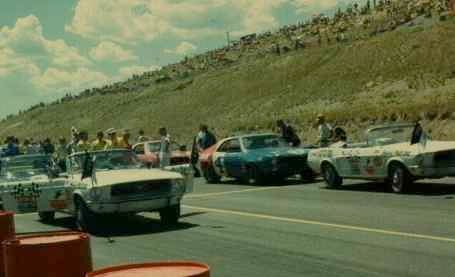 Great color picture of the 1968 Continental Divide Trans-Am grid. Thank you Jon and Craig! Here is a picture of the grid for the 1971 Mission Belle 200 Trans Am race held at Riverside International Raceway, Riverside, California on October 3, 1971. At the head of the field you can see the back of the 1972 AMC Javelin AMX that was used to pace the race. Notice the attached yellow flag. The picture was taken by John Ryals and posted by Jon Mellow in the Riverside thread: http://www.camaros.org/forum/index.php?topic=9431.30. Other pictures of the car can be seen on page 5 of this thread in replies #64-66. In these earlier posts I mistakenly identified the car as a 1971 model, but since the race took place in October of 1971, it is probably a 1972 model since new car model years usually start in the fall.